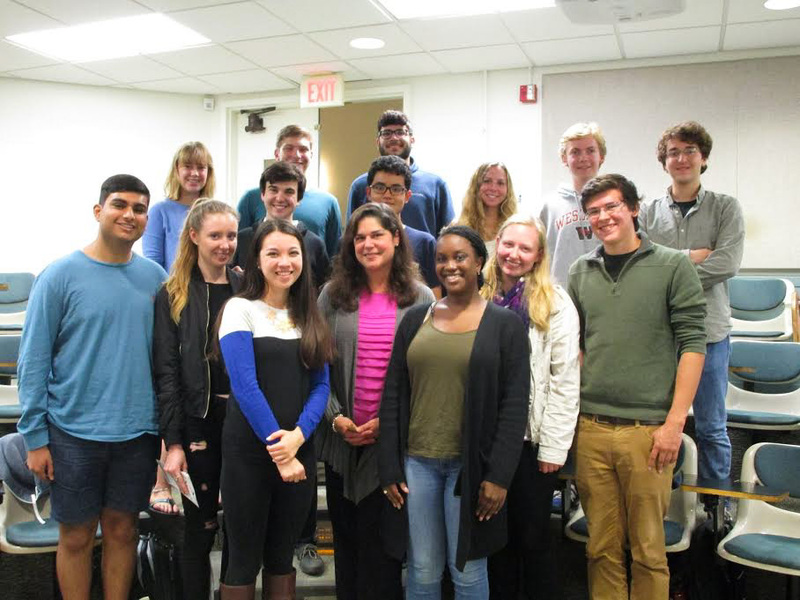 On Oct. 3, Wesleyan Democrats (WesDems) invited State Senator Danté Bartolomeo to speak to a group of students about her platform and experience as a senator, as well as her current race against Republican Len Suzio. The talk lasted 45 minutes and took place at Harriman Hall at 7 p.m.
WesDems President Simon Korn ’17 organized the event. 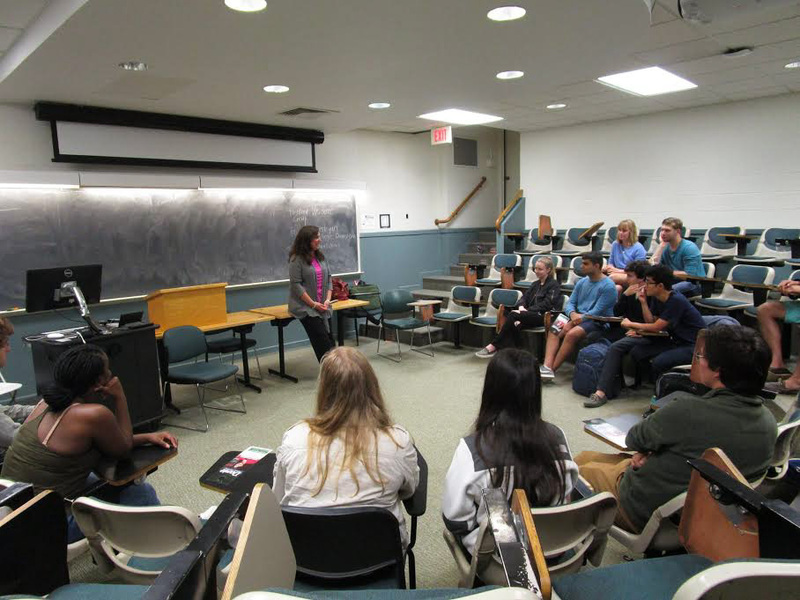 “Between her role in the higher education committee, her proximity to campus, and her close re-election campaign, which is a microcosm of several statewide issues, Senator Bartolomeo was the perfect person to introduce the WesDems to local politics,” Korn wrote in an email to The Argus. At the event, Bartolomeo began her speech with an introduction to her experience as a state senator, including her path to politics. Bartolomeo explained that her original degree from Colby College was in psychology, and before becoming a senator, she found herself in a job not directly related to either political science or psychology. She later spent some time as a stay-at-home mom, but it was through her role on a diverse range of community boards that she found herself running against then-incumbent Suzio in 2012. She narrowly beat him by less than 300 votes. She ran again in 2014 and won by a similarly small margin. Bartolomeo spoke about her achievements as a state senator over the previous few years, highlighting her role as Co-Chair of the Committee on Children, where she has worked to provide support for children with behavioral, mental, or emotional health issues. She also mentioned her role as Co-Chair of the Higher Education and Employment Advancement Committee, through which she has worked to increase college affordability. Bartolomeo equated her race against Suzio to the presidential race between Hillary Clinton and Donald Trump, with herself as Clinton and Suzio as Trump. When asked about her thoughts on budgetary matters, specifically how to get more money in the pockets of the middle class, she responded with an answer that tied into her experience as a promoter of higher education. Bartolomeo discussed options for increasing night life and public transportation in Connecticut to transform regions into thriving business and cultural spots. This, she explained, was another way to increase revenue in the state, and one that could also be promoted on the scale of local politics. She explained that there have been attempts to get money out of local politics by setting a minimum amount of donations that a candidate needs in order to receive a $90,000 grant from the state. However, according to Bartolomeo, this isn’t enough. Bartolomeo explained that in this race, a lot of money has been spent on her opponent. Connecticut Republicans only need four more seats to take a majority in the State Senate, which is why they’re spending over $50,000 on this race. Bartolomeo also took the opportunity to take a swing at her opponent, Suzio, by pointing out his past business decisions. She used this story in conjecture with campaign spending, citing the Connecticut Business and Industry Association’s support of him despite his poor record. “The reality is, I feel like I could put my business record against his anyway,” Bartolomeo said. After more discussion of education and income, as well as the Community Health Center in Middletown, Bartolomeo commented on the political climate and the ways political races have become so negative. Students’ reactions to the event were generally positive. Another student appreciated hearing about the local aspect of politics in a political climate focused on the presidential election. Student Livia Wallick ’20 agreed. Wallick also noted how difficult it is to be a female politician in this environment and expressed her respect for Bartolomeo in that regard as well. “The language surrounding female politicians and their campaigns is incredibly problematic, and she’s had to experience a lot of that from her opponent,” Wallick said. Korn, too, considered the event a success.